Nine months after opening its App Store, Apple announced on its Web site that it reached the milestone of selling its one billionth iPhone application on Thursday. The lucky winner of Apple's contest in celebration of selling its one billionth app will get a $10,000 iTunes Gift Card, an iPod touch, a Time Capsule, and a MacBook Pro (we'll let you know who won the contest and which app it was when that information is available). The App Store, which currently has more than 35,000 apps available for download, is perhaps the sleeping giant of Apple's mobile strategy. Everyone thought it would be cool to be able to download an app for the iPhone, but I don't think anyone knew it would catch hold so quickly. 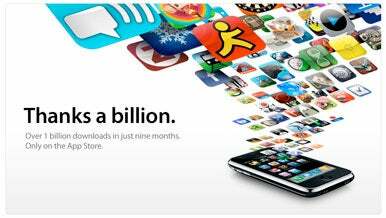 Apple's home page, touting one billion downloads in nine months on the App Store. The App Store isn't just good for Apple in terms of revenue (the company gets 30 percent of the sales), it has also been a boon for developers too. The iPhone brought a lot of developers to the platform who have seen amazing success of apps that are free, or cost $1 or a few dollars. "Tap Tap Revenge has been downloaded nearly 10 million times, so we have a lot of pride in contributing to a significant chunk of this traffic and salute Apple on the 1 billionth download," said Bart Decrem, CEO of Tapulous. Apple managed to draw out some of the big hitters in the industry to develop applications too. One of the biggest is Electronic Arts and its stable of gaming applications. "We congratulate Apple on achieving one billion App Store downloads and we're proud to have Monopoly Here & Now: The World Edition and Tetris among the all-time top selling apps," said Adam Sussman, vice president of worldwide publishing for EA Mobile. "We're excited that Need For Speed Undercover, Tiger Woods PGA Tour, Trivial Pursuit and American Idol will all be available on the App Store in the coming weeks." Bringing the big titles to the iPhone brought with it the attention of developers and consumers from every platform, not just the Mac. That has helped the iPhone and the App Store grow in a relatively short period of time. Apple recognizes the importance of the App Store, crediting it alongside the iPhone. During Apple's second quarter earnings call on Wednesday, COO Tim Cook said, "the power of device and ecosystem is enormous." Apple also said that software remains the key ingredient for a great mobile experience, again praising the App Store and the iPhone OS. "It's pretty astounding to consider that there have been a billion downloads from the app store, but in a sense it's not at all surprising. Apple has crafted a complete and thriving ecosystem: a brilliant device, a sane and compelling distribution and revenue opportunity for developers, and of course a rabid demand from consumers for content and applications of every ilk,” said John Poisson, CEO of Tiny Pictures, creators of the Radar app. "Radar is doing very well in the app store and iPhone became our fastest-growing platform overnight. We look forward to being a part of the next billion downloads." Peter Cohen contributed to this story.